Another new year, another new chef at Bastide. Following in the footsteps of Giraud, Lefebvre, Manzke, Shoemaker, and Mahon is Hunter--Sydney Charles Hunter III to be exact. Chef Hunter quietly took over Joe Pytka's notoriously fleeting eatery late last year, and has been busy revamping the food and getting his kitchen in line. A visit to sample the restaurant's new menu was certainly in order. About the Chef: Born in 1976 in Los Angeles, Sydney Hunter attended the California School of Culinary Arts in Pasadena, and during his tenure there, externed at the legendary L'Orangerie, working under none other than Ludovic Lefebvre. After graduating from the school's Le Cordon Bleu program in 2001, Hunter secured a position at Bastide, then helmed by Alain Giraud. 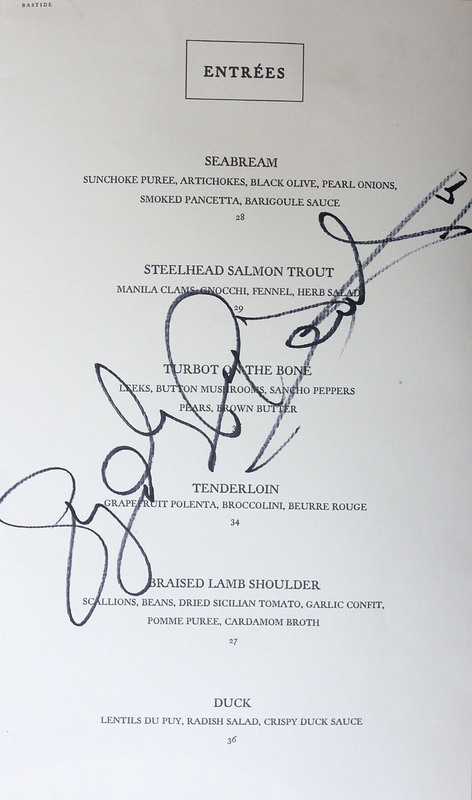 In July 2004, Ludo took over the kitchens at Bastide and subsequently promoted Hunter to sous chef. Bastide then closed in January 2006, only to reopen in September 2007 under the watch of Walter Manzke; Hunter would again join the Bastide team as sous. 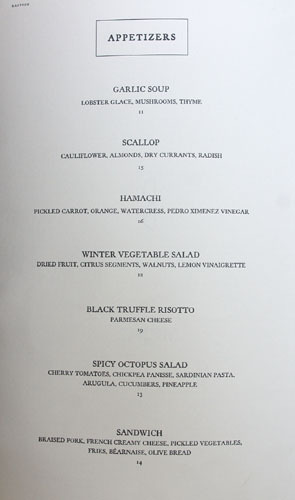 When Providence alum Paul Shoemaker replaced Manzke in May 2008, Hunter was there yet again, and stayed until the restaurant closed, once more, in November that year. 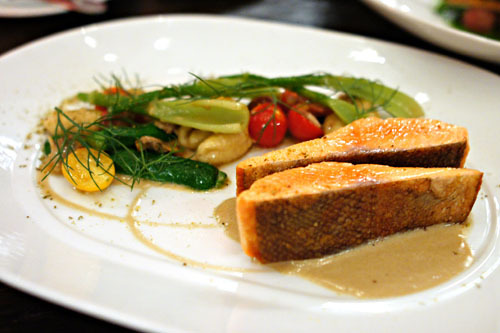 From here, Hunter moved onto Riva in Santa Monica, where he served as opening sous chef for Jason Travi. 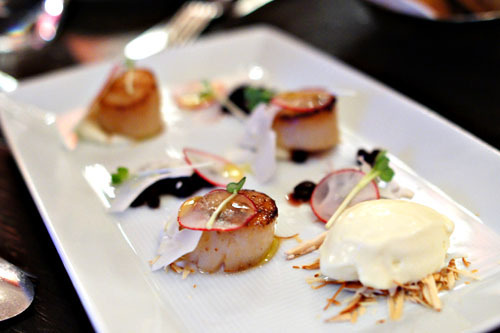 Following Travi's departure in 2009, Riva turned into Fraiche, and Hunter was named its Chef de Cuisine. He would leave Fraiche in 2010 to rejoin his old mentor Ludo at LudoBites, where he stayed until v6.0 at Max. With the departure of Bastide's Joseph Mahon back in December, Hunter has now come full circle, finally taking control of the restaurant where he toiled for six arduous years. Hunter's new menu is short, sweet, and simple--seven apps, six mains. We were able to sample every dish, paired with four superb bottles of wine expertly chosen by Sommelier Dario Dell'Anno. In addition, Dell'Anno generously provided a complementary bottle of Louis Roederer Champagne at the start of the meal (to sip on while we were getting settled). Click for larger versions. We began with a trio of scallops. The bivalves showed off characteristic hues of saline sweetness, which really linked up nicely with the fruitiness of the currants. 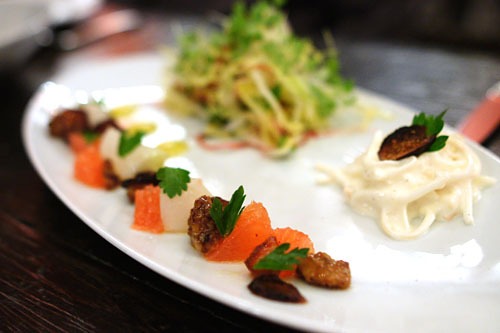 At the same time, the almonds provided a countervailing nuttiness, and I enjoyed the radishes as well. However, given that the scallops were cooked on both sides, I wanted a rarer consistency. Hamachi was up next, and demonstrated a richness and fattiness prototypical of the fish, as well as a nice bit of salt on the finish. I quite enjoyed the yellowtail alone, yet I found the contrasting tang of the pickles very pleasant as well. My favorite element here was actually the PX though; its robust sugariness was slightly jarring, yet complemented the hamachi deftly. Hunter's winter salad was surprisingly effective. The tangy sweetness of the citrus made it the star of the show for me, but its supporting cast of vegetables was absolutely crucial as well, forming a rather cohesive combination of tastes and textures that just worked. I'm somewhat of an octopus fiend, and indeed, this salad turned out to be one of my favorite dishes of the evening. The octopus itself was delightfully supple in body, with a lovely bit of ocean-y flair as well. It was augmented by the savoriness of the panisse cubes, but at the same time, the various veggies at play imparted a refreshing lightness to the dish that I really appreciated (I especially enjoyed the celery, and I normally abhor celery). Meanwhile, the couscous-like Sardinian fregula added a wonderful textural element to the course. 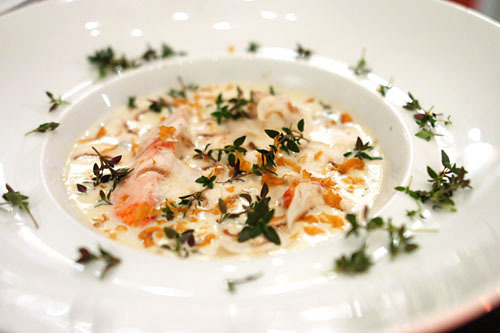 Garlic soup was quite delectable, with a satisfyingly savory attack that reminded me of the flavor of CornNuts! This then led to the sweet brine of the lobster, and the positively heady relish of the accompanying broth. One of my dining companions even called this a "salt and butter person's dream," and I wanted some more bread to sop up the remaining liquid. 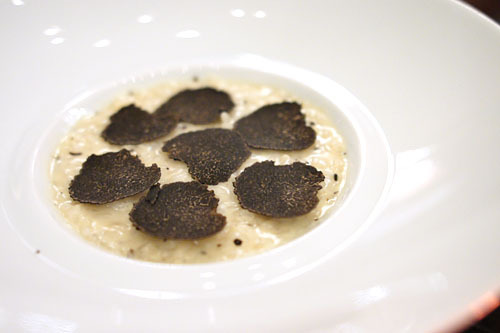 It's hard to go too wrong with a truffle risotto, and surely enough, this was exactly what I'd expected: toothsome, al dente grains of rice, elevated by the lusciousness of cheese and subsequently imbued with the intoxicating smack of truffle. 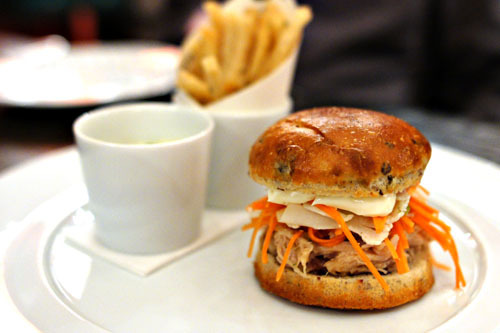 Our final appetizer course was this "Sandwich," which was actually closer to a slider in size. The pork, not surprisingly, was suitably tender, teeming with a delectable bit of porcine goodness that went perfectly with the tartness of the pickled veggies. At the same time, the frites were notable in their own right. They were delightfully crisp, and quite possibly the "fattiest" tasting fries that I'd ever had--the béarnaise wasn't even necessary. 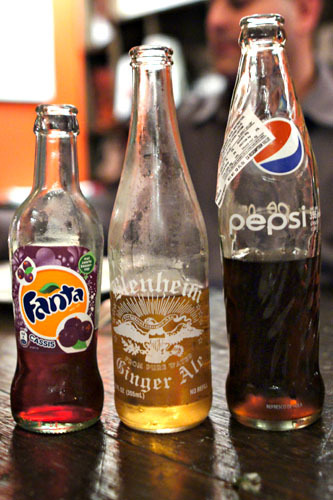 For the teetotalers in the group, Bastide also offers up a selection of interesting sodas, including Mexican Pepsi [$5], Blenheim Ginger Ale [$4], and a fantastic Dutch Fanta Cassis "met zwarte bessensap" [$4]. Our first main course brought us a beautiful filet of sea bream. The bream's flesh was delightfully delicate, with a mild flavor that was adroitly set off by the saltiness of the accompanying pancetta, while the dish's rustic vegetable accompaniments further elevated the fish. 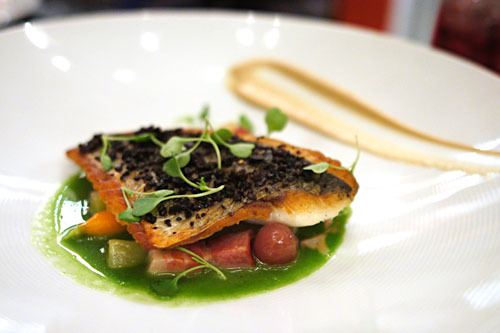 In addition, I loved the bream's crisp crust, but felt that its candied olive topping was overly sweet, and thus a bit distracting. If you're confused about the term "salmon trout" like some of us were, here's the explanation: Steelhead salmon is merely the name for ocean-faring rainbow trout. With that out of the way, the fish itself was actually quite delicious, showing off a rich, flavorful, almost creamy body typically found in members of the Salmonidae family. The slight sweetness of the fennel helped to offset the steelhead, and I quite liked the tempering effect of the gnocchi as well. In this dish more than any other, I saw shades of Ludo. The turbot was a satisfying eat to be sure, with its firm, lean, mildly-flavored flesh deftly heightened by the weight of the brown butter. At the same time, I loved the slight astringency from the leeks and how it tempered the fish, as well as the slight tingling sensation from the Sichuan pepper. However, the pears were too spicy for me, and seemed extraneous. Beef tenderloin arrived at a nice temperature and teeming with bovine sapor. I actually enjoyed eating the meat alone, finding the beurre rouge too powerful. 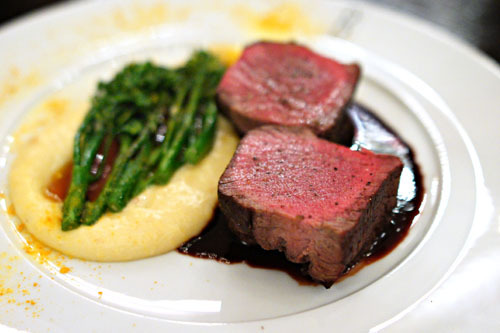 The broccolini, meanwhile, did a great job moderating the gravity of the beef with its slight bitterness. As for the polenta, it definitely had a citric tang to it that served to balance the dish, but at the same time, it was a touch disconcerting for me. Duck was rather delicious, with a fabulously "duck-y" relish that I found quite gratifying. I definitely appreciated the countervailing lightness and crunch imparted by the radishes, while the lentils served to ground the dish. 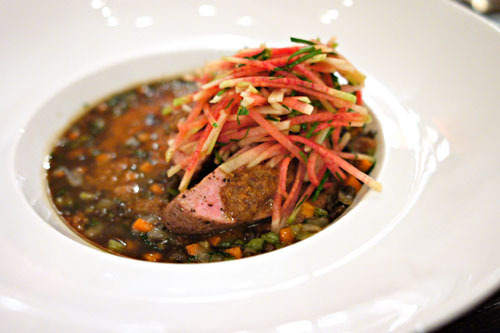 Our final savory course comprised an unabashedly tender, immensely flavorful cut of lamb, deftly set off by the herbaceous tinge of scallion and garlic. The beans did an admirable job in moderating the power of the meat, and I appreciated the pepperiness imparted by the cardamom as well. Serving as a sort of a bridge between the sweets and savories was this bonus intermezzo. Époisses, of course, is one of my favorite cheeses, and its signature smack was forcefully conveyed here. 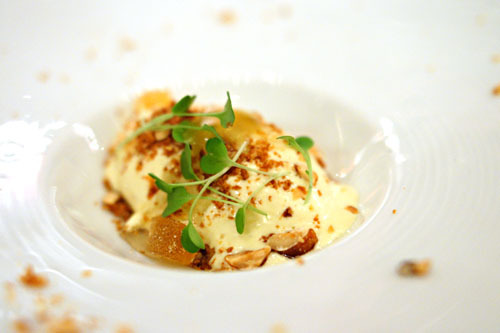 The cheese was joined by the likes of breadcrumbs, nuts, microherbs, grapefruit pâte de fruit, honey, and lemon, making for a fascinating interplay of salty, sweet, and herbaceous flavors. The sweet stuff was previously the charge of Rommel De Leon (who's now at Playa), but now dessert duty at Bastide falls in the hands of Pastry Chef Annette Picha, who also happens to be a Fraiche alum. She also worked a night at Test Kitchen last year, helping out chefs Elderoy Arendse and Ori Menashe. Click for a larger version. Brillat-Savarin Frais - A cow's milk varietal from Normandy, BS is one of my perennial favorites, and here we were able to enjoy the frais (fresh, or non-aged) version of the cheese. It was almost cream cheese-like in nature, with a more luscious consistency and a somewhat sharper flavor than usual. 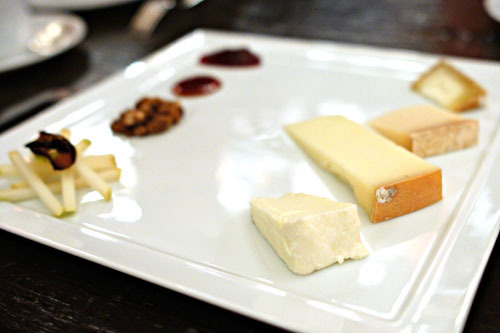 Onetik Chabrin - Next up was a goat's milk cheese from the Basque region of France. This one was subtly sweet, with a nice bit of nuttiness to boot. Schmidhauser - A French cheese from the Savoie region by Max Schmidhauser. Full-bodied and conveying a marked tanginess, with a very gritty consistency. Crottin d'Antan - Yet another French goat's milk cheese, this one was semi-hard, with strong mushroom flavors and a salty, almost blue cheese-esque character. Accompaniments included dry black figs, toasted walnuts, rosemary gastrique, cherry purée with black pepper, and Bartlett pears. 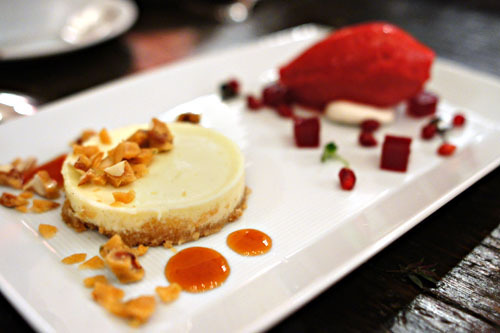 Cheese cake was one of the better versions that I'd had in a while. I appreciated its rich body and pleasant lactic tang, all augmented by the nutty sweetness and lovely crunch of its toffee topping. At the same time, the bittersweet blood orange sorbet added a touch of countervailing fruitiness. 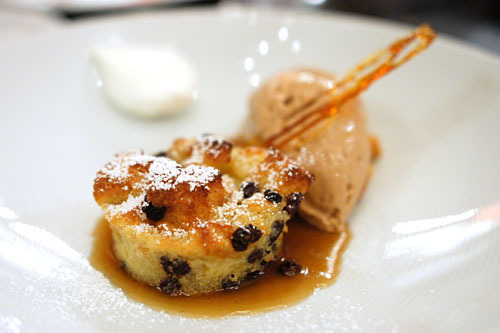 I'm generally not a fan of bread pudding, but here it was actually my favorite of the dessert quintet. The key was the use of currants, which added the perfect about of sweetness to the pudding, while the gianduja served to add a layer of chocolate-y, nutty sugariness to the dish. Next up was a reinterpretation of the classic red velvet cake. I enjoyed the cake, finding it moist and with a refined, restrained sweetness. It went swimmingly with the pistachio panna cotta, while the raspberries provided pricks of tartness to the fray. The ice cream, meanwhile, added heft to the dessert and helped tie the various elements together. Whereas all the other desserts were the handiwork of the Pastry Chef, these ricotta spheres were Chef Hunter's own creation. 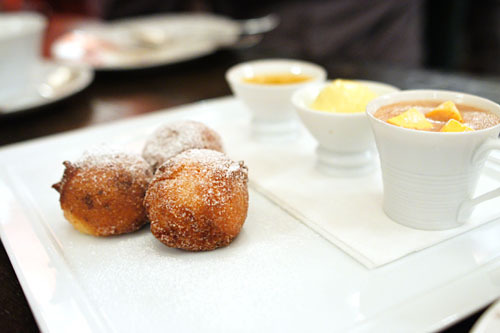 The fritters tasted mildly sweet, with the essence of the ricotta still present. The accoutrements of mango sauce, hot chocolate, and cinnamon ice cream all contributed varying types of sweetness, with the latter option being my favorite. Interestingly, one of my dining companions likened the dessert to funnel cake, exclaiming that it tasted "like the fair!" 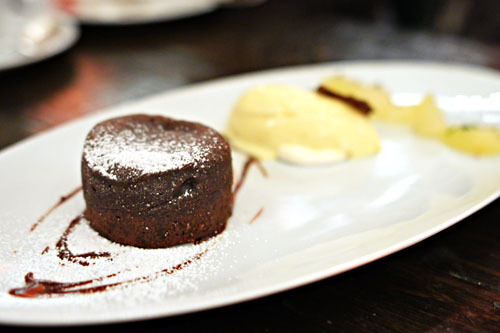 The original chocolate coulant was invented by the famed Michel Bras. 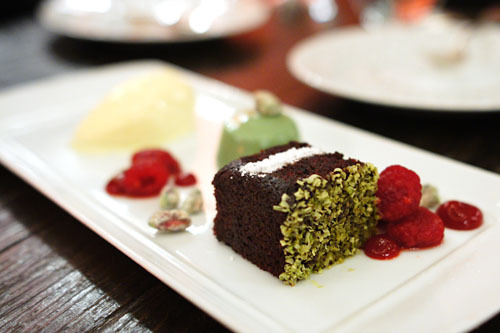 However, the dessert's been widely imitated since its creation, to the point of being clichéd in fact. Picha's version was certainly a competent one, with the cake's liquid-y center of chocolate playing nicely with the refreshing fruitiness of the passion fruit. The ginger pears, meanwhile, added a great spiciness to the mix, and I enjoyed the textural crunch of the cocoa nibs as well. 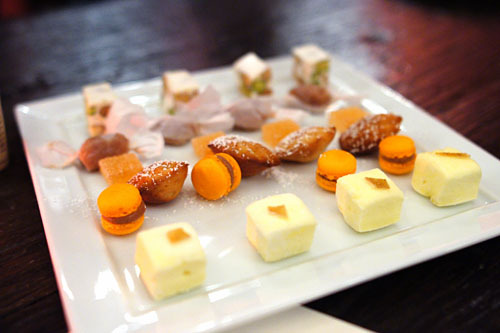 A plate of mignardises to close out the evening: sour Meyer lemon marshmallows, mini chocolate macarons, madeleines, grapefruit pâte de fruits, sea salted caramels, and roasted almond-pistachio nougats. 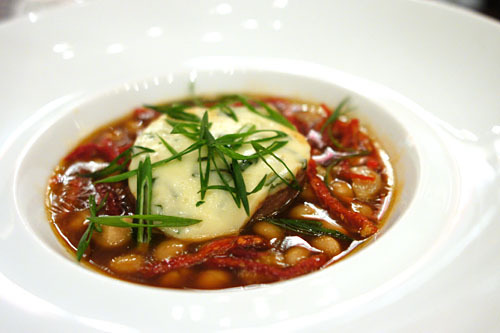 Hunter is a fitting addition to the long roster of chefs who have taken the reins of the kitchens here at Bastide. He's off to a fine start, and his cuisine continues Joe Pytka's desire to feature more casual, approachable cooking at the restaurant. However, compared to his predecessor Joseph Mahon, Hunter's food appears to be more ambitious, more challenging. I'm excited to see what Chef Hunter has in store for us now that he's finally in charge. Let's just hope that he lasts a bit longer than Paul Shoemaker did. 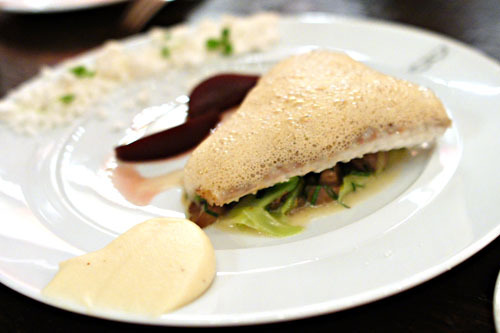 What is it with the chef turnover at Bastide? I'm not sure I've ever seen a place have so many and not actually gone out of biz and/or changed their name. I had a couple unbelievably good meals there over the years, so it was sometimes sad to go back and find something totally different. One of my Giraud meals was an 11/10, and I still amuse friends with stories of Lefebvre's "chocolate spaghetti al carbonara" (a dessert with parmesan ice cream and pancetta chunks!). When I went last year though under Mahon it had grown plebeian, so I'll give Hunter a try. Oo these dishes are all very pretty! I definitely want to dine here. Andy: Why the turnover? Apparently the owner is known for being somewhat mercurial. The food now is a bit more adventurous, though not to the level of Ludo's, certainly. Elliott: So what exactly happened with the battery? Was it just completely drained? If so, how? Jennifer: How about for that dinner with friends you emailed me about? It's not terribly expensive as you can see. 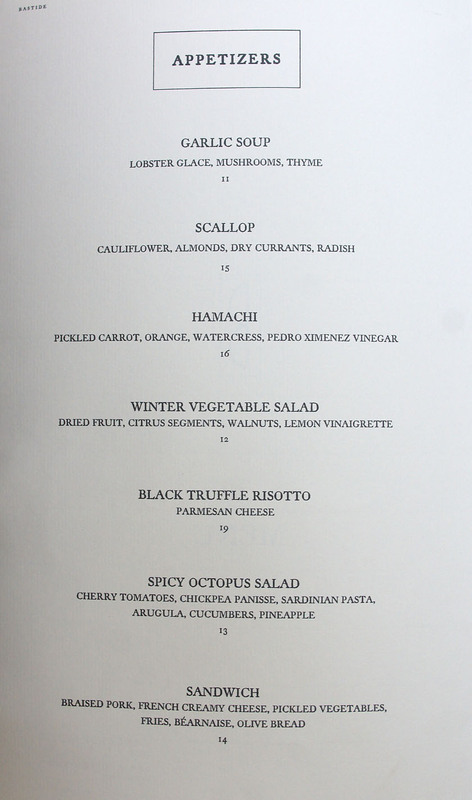 That spicy octopus salad looks delicious! 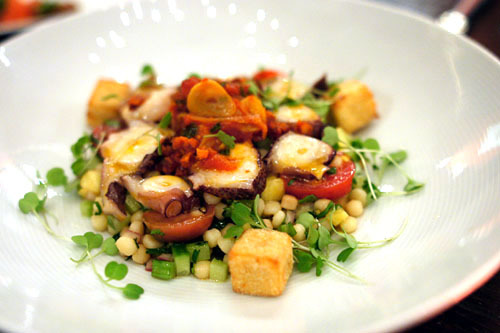 Have you had the octopus salad at Marche Moderne? It's my favorite!! The desserts look heavenly! 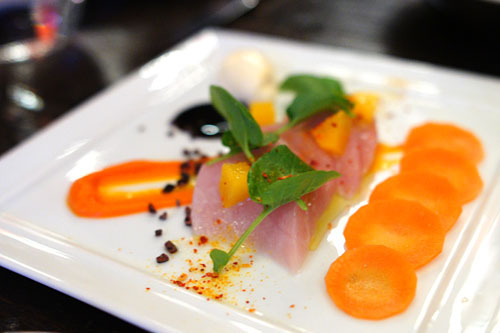 I also really want to try the Hamachi. The dishes are presented beautifully, I am impressed. As always, amazing pictures! By the way Kevin. What kind of gear do you use for your photos? I keep meaning to write a post on this. I myself use a 5D Mark II, with a 50mm macro lens and flash ring, with a Canon S90 as backup or for more casual meals (it actually does really well for such a little cam). Marian: Yes, I actually had it with Oanh and Jin, and yes, it was one of the best preparations that I'd ever had. See here. Andy: I'm currently using a Sony a500 DSLR with a Sigma 28mm f1.8 macro lens. No flash, always ambient light. I used to disdain the flash until I got the macro flash ring. It throws up a nice non directional light. It's white LED's with a very heavy diffuser. Still, even with the flash, the tiny depth of field one gets at those big apertures can sometimes be a problem. I have one pizza picture where the front crust is in focus and the toppings are all a blur. Andy: But if you have all this light from the flash, can't you just step down your aperture to f5.6 or something to get a wider DOF? What are your typical shutter speed and ISO? Jennifer: Good call on Animal. You should check out their other restaurant, Son of a Gun, as well. I usually do stop it down, at least into the 4-5.6 range, jump the ISO to 800. Still I like to get at least 1/30, better yet 1/60. Even at 5.6 the DOF on my 50mm macro is 0.03ft (focusing at 1 foot, 2 feet is 0.15 ft DOF). That's the trade off of a macro lens. But on the plus side it can focus at 8 inches. It's not too bad with the flash. Without it, in some of those dark restaurants, I'd have to shoot at ISO 6400 to get a decent shot, and I hate to do that. Was shot with no flash, then color corrected. You can see the hilarious crust in focus shot. Lightroom is a real savior too, as it can fix mild blowout with the flash, or color correct away that orange ambient cast -- all quickly. Andy: Wow, I definitely see what you're talking about with that pizza. Our settings are really different though. I usually shoot at ISO 1600, f2.0 to f2.8, 1/8s to 1/15s, with a 28mm macro. I am image stablized though, which is crucial. Anon: Unfortunately that doesn't surprise me, and is what I've heard from others as well. My macro doesn't have IS (lots of my other lenses do -- but the only Canon macros with it is the 100mm, which I haven't tried ($1000), but I suspect is too long as one would have to back way away from the table. The 5D being full frame, has a lot smaller depth of field too, but I suspect I need to start pulling back a bit, looking at the DOF calcs focusing so close is tending toward the small DOF. Really this is probably the ultimate lens for it, but it would meaning getting back farther. So which other lenses do you have? There aren't too many stabilized macro lenses out there. Mine isn't either, but the body itself is, which is a nice touch. Focus distance is definitely a big deal for me. Currently I can get within inches of my subject. Having to pull back would make for some awkward posturing. Another thing with the 100mm is that it's only a f2.8; I'd prefer f2.0 or faster. I decided to check out the new chef with my Foodie group (click for review). Good, although I wasn't blown away. As to lenses. I have a mess of non macros. 50mm 1.4, 16-35L, 24-105L, 70-300 DO, 100-400L. The 50mm macro though is the only one I regularly shoot food with. The closer though you are to your subject, the smaller the DOF (by a lot), so I don't get how you don't run into the problem. What's the sensor size on your camera? Is it the normal 1.6x (mine's full frame), or even smaller? My S90 (little camera) has a huge DOF (most snapshots do). Great post Andy--good to see that the menu has evolved since my visit. As for lenses, I have: 28 f1.8, 50 f1.7, 85 f1.4, 20-35 f3.5-4.5, 28-70 f2.8, and 80-200 f2.8. Of course, the 28mm is used >99% of the time. I think I'm able to get a reasonable DOF because of the shorter focal length. I'm running a 1.5x crop, so my 28mm becomes 42mm effectively.